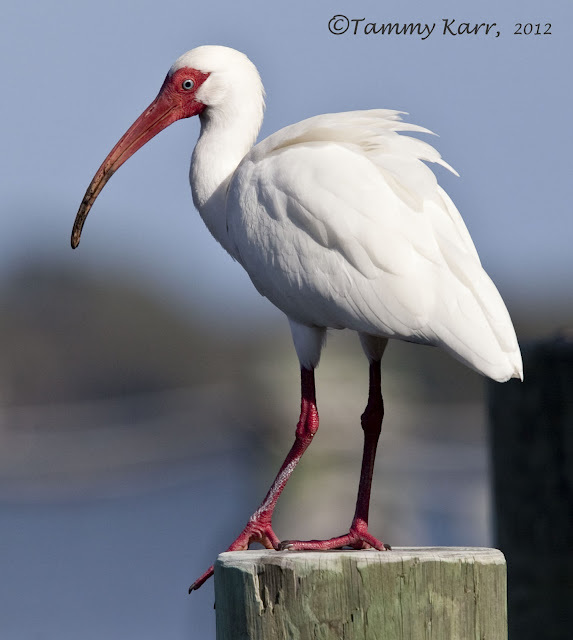 The White Ibis is a distinctive bird found commonly in Florida. Ibis can be seen here year-round probing in yards or wading in the water. Ibis are tactile feeders; they use their long, down-curved bills to feel for insects, frogs, snails, snakes, and small fish. so nice these colors and sharpness !! Thank you Joop for your kind comments! I love these up close and personal shots of the white ibis, Tammy. I am in awe of all your photos. Thank you so much Pam:) I hope you have a great weekend as well! Beautiful photos. They look quite different to the Australian White Ibis, which I'm use to seeing. Thank you Russell! I just checked out a photo of the Australian version, and they are very different! Very interesting looking! Such vivid pictures! They're striking enough to make me take an extra long look next time I see this common Florida bird. Very nice! Beautiful images Tammy. I especially enjoy the close up because it shows those baby blues so well! Thank you Mia! I love their blue eyes as well. Hope you get to see them again Andy! Lovely shots. It's a pretty aline-looking bird but beautiful nonetheless. Thanks for your comments Laurence! I did get a funny shot of the whole flock in "a line" along the dock rail, but the sharpness was poor. Lovely birds, lovely shots and a great attraction for photographers i think ! The clear eyes against the snowy white feathers are made for photos.... well done again, Tammy ! Thank you for your comments Lorents! These birds are lovely to photograph with their wonderful colors. Those are gorgeous shots! I like the color in the face and legs against the white plumage. Thank you Brian! I really like their colors as well! Que pico más enorme y que blanco más pulcro. Su pico es muy grande! Thanks for your comments Rachelle! That is some White Ibis synchronicity for today:) I have never seen the White-faces Ibis; I believe sightings are rare in this area. I would love to come across one of course!! Meant to say " I haven't seen a White-faced Ibis"
beautiful images, well done Tammy. Really liking this bird. Thank you very much Shaun! stunning stunning stunning photos...we had a white egret here who was far from home....some people called it an ibis. 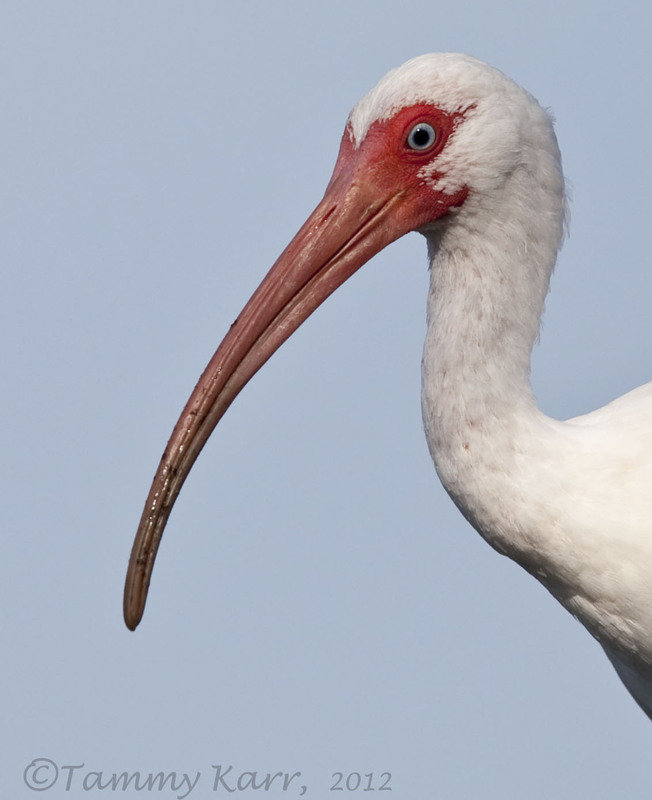 Absolutly smashing bird, the White Ibis is another that I've never heard. Thanks Tammy. What a stunning creature, beautifully photographed. Wow, que preciosidad de ibis! el ojo es espectacular. Stunning! You must feel something wonderful when you can capture beauty like this. Wonderful, sharp images of a beautiful bird.